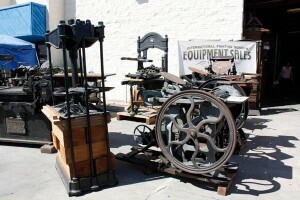 Printing Presses and Equipment on sale. The Printers Fair showcases the art of letterpress printing and paper in historical and contemporary forms. Vendors items include book arts, letterpress printing, paper, printmaking, handmade announcements & invitations, posters, limited edition books and more. 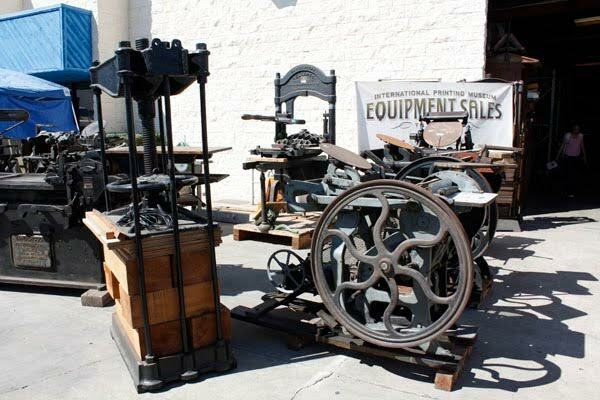 There will also be “The Largest Letterpress Swap Meet in the West” with letterpress supplies, wood and metal type, ink and presses including Windmills, platens and rare Vandercooks. Printing demonstrations and tours for visitors throughout the day in the Museum’s galleries! NEW THIS YEAR!!! 3-D PRINTING DEMO! Also various artists from the LA Printmaking Society demonstrating a variety of printing techniques as well as guest artist Master Paper Maker Colin Browne putting a modern edge on the ancient Art of Papermaking….circle that date and come to the Fair!! Credit: The International Printing Museum.